In the comments to “Programs for reading online content off-line” a number of readers highly recommended Read It Later to the list of Evernote, Instapaper, and ToRead off-line viewers. J.D. Roth of GetRichSlowly.org has a thought-provoking piece on “The Rewards of Frugality and Thrift (or, Why We Scrimp and Save)” that I really enjoyed. It gets to the heart of what I believe is uncluttered spending. The London Times (a site you have to register to read) has an article in today’s issue about the Butter by Nadia dress. The dress is one piece of fabric that can be styled to wear 15 different ways. At the very least, I’m extremely curious! When money got tight, writer Kevin Mims found that uncluttering his home and selling the items at an antiques co-op made for good money. Check out his story “Out With The Old, In With The New Beginnings” on NPR. Reader Megan tipped us off to an article in this week’s Chronicle of Higher Education that discusses how to prevent feeling overwhelmed and overloaded by your work. Like so many things in life, you need to “always keep in mind what it is that you want to do, to build, to create in the world, whether that’s through a course, an article, or a new administrative structure.” The article is written for college professors and administrators, but is easily adaptable to any profession. 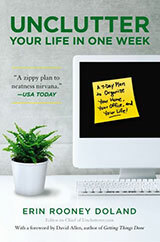 Lifehacker linked to a terrific post on Stepcase Lifehack discussing “How To Stay Organized When Life Throws You a Curveball.” It’s uncomfortable to read about what to do during a crisis, but very important if you’re in the situation. One last thing, I accidentally switched the post order today and put up the Unitasker Wednesday post as the first one and this post in the 10:30 a.m. spot. I think this is a sign I need more coffee. Check out our 7:30 a.m. piece if you’re looking for today’s Unitasker. The Happiness Project Toolbox is a resource to help you commit to writing those things that matter most to you. You can roll the sandbox into your garage when not in use (keeping out unwanted cats and pests), wheel it onto a patio or grassy area when in use, and you can roll it over to a neighbor’s house for their children to use when your kids outgrow it. Consider tables that nest so furniture can adapt to the changing demands of different living spaces. The Hoppop is a diaper bag that transforms into a baby seat. Mr. Jobs, you seem to wear the same thing every day. Maybe I’m barking up the wrong tree? 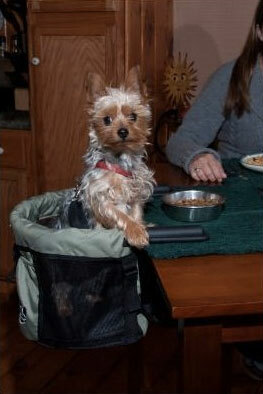 For all I know, this pet highchair is fetching in the dough for the Pet Gear company! There might have been high-fives around the conference room and bosses were rolling over for its designer when this puppy was first revealed. It’s probably a good thing I am not working in the manufacturing industry. One last thing, the Los Angeles Times recommends checking out this unitasker’s competition — the corresponding photo is priceless. I think of this organized preparation every time I watch the Olympics. The five minute gymnastic routine or the less than 30 second speed-skating race took decades of daily practices, workouts, proper nutrition, sacrifice, and emotional turmoil to make happen. Success doesn’t happen overnight, and it certainly doesn’t happen surrounded by clutter. To be at the top of any profession requires commitment and structure — even for artists. 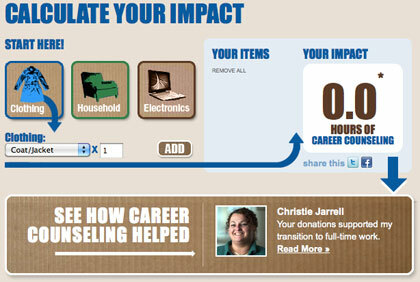 Anything to encourage the donation of useful items to charity is a great initiative in my book. I hope Goodwill’s new project gets people to evaluate their stuff and make room for what really matters in their lives. Today’s guest post is from reader Alban Guillemot who writes in Australia for a personal finance and credit card advice site, creditcardfinder.com.au. Be clear on your goals as a family. Open and honest communication with all family members is important because if one person is not convinced of the family’s financial plan, those plans can be sabotaged by overspending and ignoring the budget. Consider your family before making a purchase. Always keep your family budget in mind before you make a purchase that has not been accommodated for in the budgeted. This also goes back to the previous point about why you are making the purchase — is it a purchase that is good for the whole family? Consider the impact of an impulse off-budget purchase on your family’s savings and goals. Hold regular family budget meetings. It is not enough to create a family budget, you have to also maintain and monitor it to make sure it is achievable and accurate. This can be done at a regular family meeting, where you also discuss how each member feels about the budget and the spending, and whether they can see room for improvement, or suggest a change of direction. Discussing finances with your family with honesty and respect is the key to successful family finances, but while discussions are important, you also need to be able to implement the systems to follow through. Once you’ve completed the four tips from above, you’ll find ways to customize each system to your family’s needs and find a way to ensure your family is financially secure now and into the future. In my quest to live an uncluttered life, I’m reminded from time-to-time that convenience and efficiency don’t always coincide with fewer physical objects. 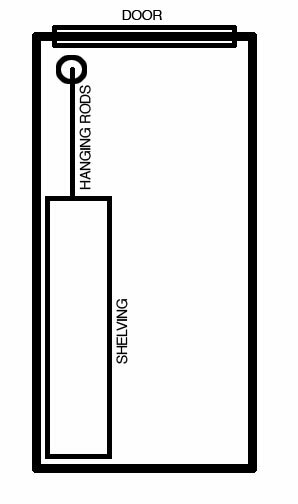 An example of this, at least in our home, can be explained with scissors. In theory, we only need one pair of scissors. We could begrudgingly survive with just one pair, and having seven pair likely seems excessive to a minimalist. However, for the sake of convenience, we have a pair that I use with food in the kitchen, another is in our present wrapping kit, I’ve got one in my clothes closet to cut off stray threads and tags, one in my desk drawer and one in my husband’s desk, a hefty pair in with my gardening supplies, and there is a small pair in the bathroom that is sanitized and stored in our emergency medical kit. For our family, having fewer than seven pair of scissors would be frustrating. We’d waste time hunting down the one pair of scissors, and there would likely be more than one person needing the scissors at a time. Another obvious example of this is clothing. Sure, we could get by with just one change of clothes, but it would be extremely inconvenient to have to do laundry every night. 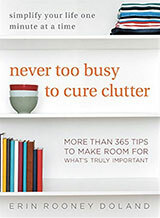 Uncluttering isn’t about having the fewest things, it’s about having the right amount of things for your life. Clutter is any distraction that gets in the way of the life you desire — and sometimes, having too few things can be just as distracting as having too many. As you are going through the uncluttering process, remember that there isn’t a competition to see who can have the fewest things. The purpose of uncluttering is to right-size your possessions and commitments so that you can focus on what matters to you most. A new player has jumped into the electronic invitation market, and it is MyPunchbowl. This week’s workspace of the week is Pinkernaute’s pristine office. Reader Jules has more wine that she can store or consume in a reasonable amount of time. Check out these tips from Google to get the clutter out of your Gmail account. 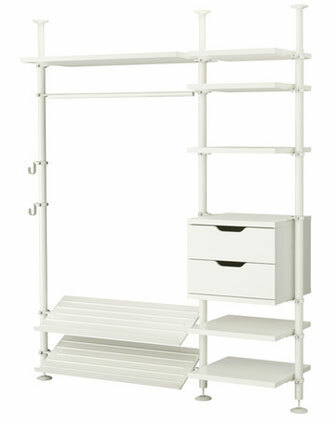 And, the Elfa closet system sold by the Container Store might also work for you. The drawers of the Elfa system are nice because they’re on ball bearings and pull out and push in easily. Unfortunately, the price tag on the Elfa system is higher. Good luck to you, and I hope you are able to find a solution that works for your space and needs! Thank you, Sue, for submitting your question for our Ask Unclutterer column. 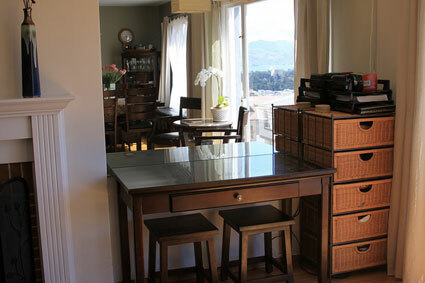 This is our living room art table/homework table/workspace in our small San Francisco home (the view you are seeing is the bay and Marin Headlands). We installed the mirror to get more of that view reflected into the house. Right now you see table ready for my two kids to do some artwork or homework. We added a glass top to the table to protect the wood, so the kids can go crazy with glue, sharp pencils, whatever! The drawers on the right are filled with all their supplies. My laptop is tucked just below the ream of paper. The back of the table is finished and has no lower support, so this has also been used as additional seating for 4 for Thanksgiving dinner! Here you see the table set up as a workspace (I’m a web developer). I use a comfortable dining room chair that I grab from a few feet away in the next room. The table drawer is actually a keyboard tray, and I use a cordless keyboard and mouse. I’m able to grab some paper from the storage on the right, but otherwise I’m paperless. 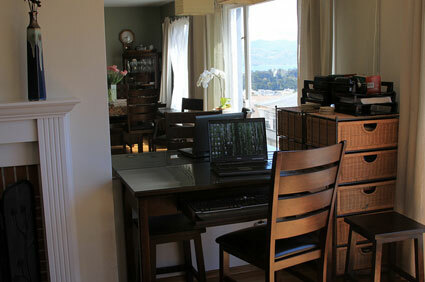 Thank you, Kathleen, for sharing your workspace with our Unclutterer community! 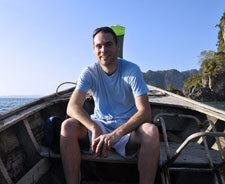 Today’s guest post is from Sean Ogle a location independent writer and entrepreneur who is currently based out of Bangkok, Thailand. Welcome, Sean! For years I’ve strived to live a simple lifestyle. And, up until four months ago, I had failed miserably at it. I’ve always been a pack rat, and the amount of meaningless stuff I’d acquired would make a pawn shop owner blush. So how have I chosen to go about uncluttering my life? I quit my job, sold my car, and am working while traveling throughout southeast Asia. Oh, and I’m doing it all with nothing but a backpack the size of one an eighth grader might use. Yes, it’s a drastic way to go about changing my life, but drastic times call for drastic measures. I wasn’t happy with my job as a financial analyst, and I knew that if I didn’t have my global adventure soon, my obligations would get the better of me. With the help of my trusty North Face Surge, I disposed of everything I owned, except that which I could fit inside my new pack. I have no affiliation with North Face whatsoever, but I have to tell you, this is one of the most well designed and useful packs I’ve ever used. It’s much more flexible than a traditional laptop case, and has enough room for everything I’d hoped to bring on my six month trip. That’s saying something. I’ve been on the move for about three months, and it’s incredible how simple my life has become. No longer do I worry about all of the details that seemed to be such a big deal. Does the car have enough gas to make it to work? Did I leave the coffee pot on? Am I going to get that big raise this year? Sure, I have my own set of concerns, as I’m now working for myself on a variety of web-based ventures, but those hold true for any entrepreneur; giving myself the freedom from overwhelming amounts of “stuff” has been well worth it. I fully understand that this is an extreme way to reduce clutter in your life, and it is certainly not for everyone. However, for those looking to make a change, and perhaps experience a little adventure, living out of a backpack for a short (or long) period of time is the perfect way to figure out what is truly essential in your life. In college, my friend Scott lent me his dog-eared copy of Hackers and said I should read it. I knew my way around the command line, and Scott was trying to convince me to switch majors and join him in the computer science department. I read the book, was mesmerized by its genius, but decided to stick with journalism. As much as I was fascinated with the people and the ideas in the book, I knew it was because of their stories, not because I wanted to emulate their engineering and programming. Jump 15 years forward. I was standing in author Steven Levy’s office holding a trash bag and asking him if I could throw away a crumpled business card I’d found at the back of his closet. Turned out, the card belonged to a current executive at a major tech firm, but was from a time when the guy was a nobody at another company. I told myself that if Levy decided to trash the card, I’d slip it into my pocket instead. We organized dozens of business cards like the one I found in the closet, tapes of recorded interviews, preview copies of software, baseball memorabilia, hundreds of notepads with names like “Gates” and “Jobs” scrawled on their fronts, research files, files, and more files. While we worked, he told me about how he found Einstein’s brain in Kansas, tracked down Bob Marley and Bruce Springsteen for interviews when he worked for publications in Philadelphia, and explained to me what is really going on with Google in China. I was there to help Levy organize his office for the July issue of Wired magazine, but I felt more like I won a contest to spend a few days with an iconic journalist and author. Although I hadn’t met him before the project started, I felt like we were already good friends because of my connection with his book. Since the early 1980s, Levy has been reporting on the technology industry in the U.S., and a good portion of that work was in his home office in the Berkshires. We were able to condense, unclutter, and organize more than 15 boxes of files into two elfa rolling file carts. As is pointed out in the article, the portable carts were a must so that “Levy can roll his files with him wherever he goes” to work in his home (when the power goes out in the winter, there is a wood-burning stove in the living room to keep the space warm). We also upgraded all of his equipment — added a second monitor and Fujitsu ScanSnap, installed an automatic digital data backup system, traded up to an APC battery backup power supply, gave him a much-needed paper inbox and task lighting, updated his audio system, and, although you can’t see it, we overhauled his desk drawer and outfitted it with supplies generously donated by the companies of Newell Rubbermaid. It’s difficult to tell from the angle of the photographs, but we hauled two SUV-loads of clutter to the dump and recycling center before the project came to an end. I encourage you to check out the transformation of Levy’s space, either online or on newsstands. Also, feel welcome to put any questions you might have about the project in the comments, and I’ll try to answer them. I don’t usually speak or write about my work with clients to respect their privacy, but since this one was featured in a national magazine, I feel comfortable sharing a few of the details about the work we did. Image by Noah Sheldon for Wired.